Goals are the tactics that make strategy come alive. Too often, goals fall short because of a failure to bridge the gap between strategy and execution. One year goals are the key to bridging that gap. In the book The 4 Disciplines of Execution, the authors state that 85% of employees do not know what their company’s goals are. A strange phenomenon happens in many organizations once the top level of leadership establishes the one year goals… the goals aren’t thoroughly communicated to the next level. There is either an assumption that everyone else will inherently know what the goals are, or an expectation that because the goals were communicated in an email that everyone else will automatically know what to do with them. This creates a disconnect. Think of one year goals as the baton in a relay race. A relay team is comprised of a team of people, each doing their part before handing the baton to the next person. 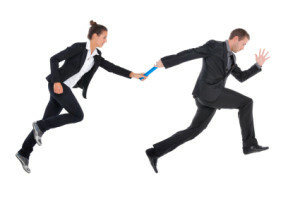 One year goals are the baton in the relay race at an organization and the handoff needs to follow a specific order for successful consummation of the goals. The order for the handoff is top leader to senior leader to manager to individual contributor. If any of those handoffs fail there is a high risk for failure to execute on the strategy. In many organizations one or more members of the relay team are left hanging out on the track waiting for the leader to come around the turn and make the hand off. Unfortunately, the leader never comes and they lose the race. Or, there isn’t a clean handoff and the baton drops causing the team to fall behind and lose their competitive advantage. In the relay race of achieving annual goals, make sure everyone knows who is on the team and what order the handoff should occur. If you do this, your chances of winning are very good.